From the 1910s to the 1970s, author and linguist J. R. R. Tolkien worked at creating plausibly realistic languages to be used by the creatures and characters in his novels. Like his other languages, Sindarin was a new invention, not based on any existing or artificial language. By the time of his death, he had established fairly complete descriptions of two languages, the "elvish" tongues Quenya and Sindarin. He was able to compose poetic and prose texts in both, and he also constructed a lengthy sequence of changes for both from an ancestral "proto-language," comparable to the development of historical languages and capable of analysis with the techniques of historical linguistics. 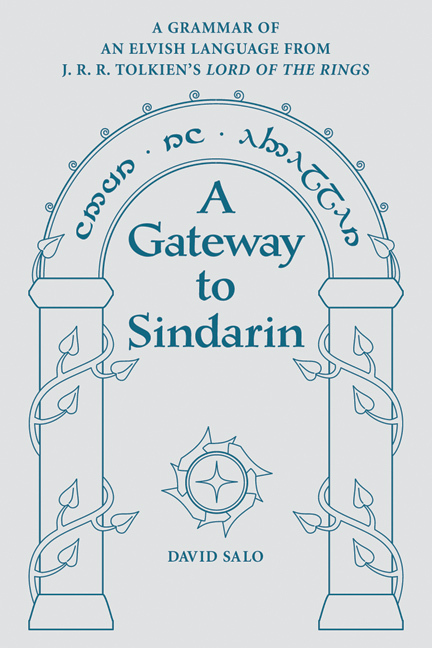 In A Gateway to Sindarin, David Salo has created a volume that is a serious look at an entertaining topic. Salo covers the grammar, morphology, and history of the language. Supplemental material includes a vocabulary, Sindarin names, a glossary of terms, and an annotated list of works relevant to Sindarin. What emerges is an homage to Tolkien's scholarly philological efforts. David Salo is a doctoral candidate in linguistics at the University of Wisconsin. He was the primary linguistic consultant to film director Peter Jackson for the Lord of the Rings movie series.